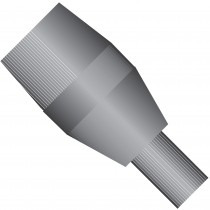 Two-Piece Fingertight Fittings feature a separate ferrule. With a two-piece design, you can replace just the ferrule instead of the entire unit, making these Fingertights more economical than the one-piece version. Use a standard knurled head fitting for traditional fingertight applications, or use a fitting with wings built into the head for extra tightening leverage. A stainless steel hex headed fitting can be used for applications where a wrench may be needed for added tightening torque.